Wandering the streets of nineteenth-century London on Christmas Eve, Albert seeks warmth and finds it in a red, velvety sack. When he crawls in to sleep, he expects to dream of happiness and love, but ends up discovering something quite different. Young Albert enters the magical realm of Santa’s great red sack and is welcomed into this fantasy world by a host of happy toys, waiting to be given to grateful children on Christmas Day. However, Albert soon learns that he has not left the danger of the outside world behind. A diabolical toy, known only as No-Name, is determined to stop Christmas. He and the other “Garbles” are snatching the smiles of Albert’s new friends. It’s up to Albert, who is mistaken for a toy, to stop the ever more desperate war. This story, with its balance of suspenseful action and lively humor, has been optioned by Disney for film rights. Wesley Eure’s imaginative writing and Ronald G. Paolillo’s full-color artistic renderings give each character a special breath of life as they cross the pages. 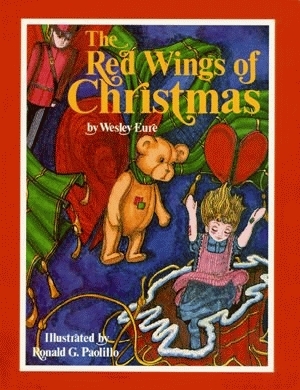 The Red Wings of Christmas is sure to become a family holiday classic to be shared season after season. Wesley Eure, is no stranger to scripted lines. For fifteen years he’s starred in television, stage, and big screen productions and now brings his dramatic and comedic experience to life in his first children’s book. Many of Eure’s fans will remember his eight-year award-winning role as the rebellious, romantic Michael Horton on NBC’s “Days of Our Lives.” But what is most dear to his heart is his work with children. His many youth-oriented credits include three years starring as Will Marshall on the NBC youth cult-classic Land of the Lost. He has also been a top fund raiser for the March of Dimes. Ronald Paolillo was born in Cheshire, Connecticut, and by the age of fourteen, Paolillo had already started his own theatre company. He graduated from the University of Connecticut with a BA in dramatic arts. Paolillo has traveled nationwide to perform in a range of theatre productions. Paolillo is known for his skilled color and black-and-white pen-and-ink works.